The northwest corner of the Town & Country Shopping Center is about to undergo major renovations that will last several months. During this time the McClendon’s Select farmers’ market and Noble Bread will be moved to a temporary location starting Wednesday, March 26th through the duration of the 2014 season. Our last market at Town & Country will be on Wednesday, June 25th. The new location for McClendon’s Select will now be INSIDE an empty store front on the north side of the Town & Country shopping center, next to Yogurtology. Look for the McClendon’s Select banner hanging in front of the entrance. 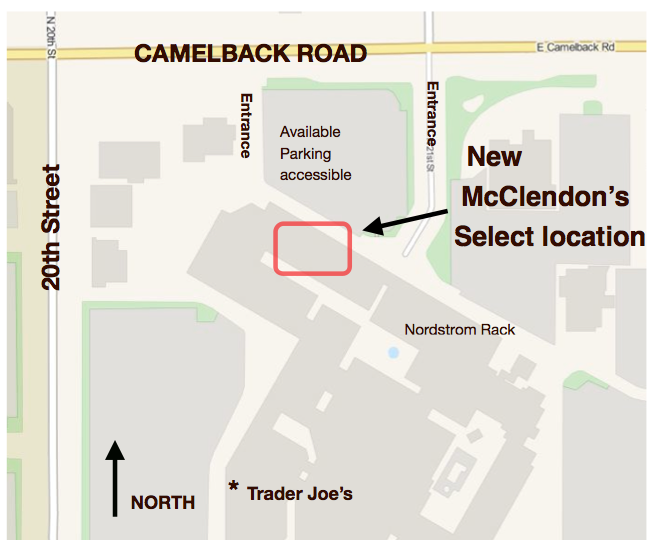 We suggest you use the parking lots on the north side of the shopping center off of Camelback Road, as those will be the easiest to find available parking spots and the closest to our new location. We recommend avoiding the south parking lot in front of Trader Joe’s, as it will be very crowded, due to the loss of parking spaces caused by the renovations.